In February 2017, the E+O team secured this Hamilton home and income on behalf of a long-standing client. Purchased for $815,000, the property and minor dwelling is currently being rented for a total of $870 pw, delivering a yield of 5.67%. This 1950’s to 1960’s brick exterior house, has three bedrooms and one bathroom. 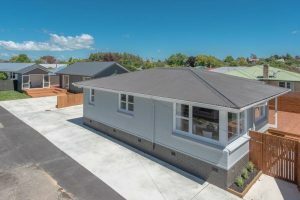 Recently added to the 675m2 site was a minor dwelling with two bedrooms and one bathroom plus a 10m2 cabin that can double as a third bedroom. Click here to get in touch about learning how E+O can help you secure an investment property that meet your financial goals.